The same way Republicans beat it when Bill Clinton proposed a modest $35 billion stimulus in the teeth of the 1992-1993 recession. The GOP nitpicked each spending item and highlighted midnight basketball courts and swimming pools that were funded in the package. Clinton, for his part, didn't really care what the money was being spent on, he wanted to be sure it was spent to give the economy a boost before he cut spending and raised taxes to balance the budget. So, the president accommodated all of the pet projects of Democratic lawmakers. The resulting publicity made the package radioactive. Republicans are ideologically opposed to spending, but they never met a tax cut they didn't like, except a payroll tax cut, which would help the vast majority of the nation's wage earners. Republicans view wage earners with contempt. Republicans should feature each element of the package -- just as they have highlighted the contraception and global warming research -- to show it for the boondoggle that it is. Time to engage the Hollywood and Madison Avenue imagemakers, who are the natural allies of Democrats, to counter Republican propaganda on this. The package is losing support almost daily. According to Rasmussen, only 42% of Americans now support it. The key is for the Republicans to attack its specific line items to show how overblown it really is. And it is terribly important to beat, or at least cut back the stimulus legislation. What we allocate in deficit spending and "refundable" tax cuts (i.e. welfare) today we will pay for in inflation tomorrow. Not true. Inflation would only be a cause for concern if the economy is running at full capacity, where all of its resources and capital--including human capital--are being used. We are far from that. Inflation has nothing to do with the nominal level of bank reserves in the system and is not, as we often hear, a monetary phenomenon. In the seven years between 2000 and 2007, the money supply rose from $600 billion to $800 billion. In 2008, alone, it more than doubled from $800 billion to $1.7 trillion! We cannot sustain this level of increase in the money supply without having way too much money chasing way too few goods and services, sending prices up into double digit inflation. He seems to be confusing the monetary base (Federal Reserve notes, coins and bank reserves) with money supply (M1, M2). Bank reserves, which represent the largest component in the monetary base, are not part of the money supply. Morris doesn't understand this. Furthermore, he doesn't understand that the Fed targets interest rates and it does this by manipulating reserves. To achieve a 0% Fed funds rate, reserves have to be increased significantly and kept high for as long as the Fed wants the 0% rate. While the economy is in shell shock, at the moment, we face deflation. But once it begins to come back and the dollars come out of hiding, we will find the resulting inflation intractable and very difficult to cure. This is his opinion and not a fact. It also fails to realize that the sale of Treasuries will bring the level of reserves down. It's already happening. And it fails to understand that the current tax structure automatically produces rising levels of fiscal drag as the economy grows faster, just as it automatically acts as a stabilizer when the economy contracts. WSJ article on Peter Schiff is out! The Wall Street Journal article on Peter Schiff is out. Go here to read it. Taxpayers are making money. But are they? Please read the brilliant post from Warren Mosler's website, then see my comments that follow. "With the Fed balance sheet at just over $2 trillion and an average coupon of maybe 3% that means they are removing about $60 billion a year of interest income from the non government sectors. So while I do think lower long term rates serves public purpose, I also recognize the need to cut taxes and/or increase other government spending to reverse the restrictive nature of that policy. This applies to all Fed rate cuts that remove income from the non government sectors." The record expansion of the Fed's balance, which was driven by the buying of assets, will result in a windfall profit. Warren Mosler estimates that it could be in the neighborhood of $60 billion, which would be about two or three times what the Fed ordinarily earns in one year. So, isn't this a huge profit for the taxpayers? After all, the Fed is required by law to turn over all of its profits to the U.S. Treasury (with the exception of what it needs to operate). All the genius media commentators, lawmakers and economists who complained for so long that the Fed's balance sheet expansion represented a huge "risk to taxpayers" are clueless that the Fed is about to make more money than it ever has. In other words, taxpayers are getting a huge payday. Right? Here is where the real irony is. By definition, if the Treasury is receiving this money, it is money that would have been paid out to the public. So the $60 billion profit that the Fed made actually represents a net drain of $60 billion in income that would have gone to the public! Looking out for taxpayer money, in the end, means that taxpayers really lose. Don't expect anyone but a very small group of economists to understand this. Another Rubin legacy, "mark-to-market" asset pricing. This should have been eliminated a long time ago. At least he admits now that it was a bad idea. However, how stupid would it be to remove bank assets to an aggregator bank at this point in time?? That's like selling out at the bottom. A year or two from now when the economy is back on track and asset prices are rising once again the banks will have to buy back those very same assets at much higher prices. Dumb!!! I know it's never going to happen, but Jeff Immelt should be given a medal for standing up for long-time, loyal, shareholders. By not cutting the dividend even though he is under immense pressure from Wall Street and malicious speculators to do so, Immelt is displaying enormous courage and leadership values rarely seen in wimpy corporate execs these days. In contrast, Pfizer's weasle CEO, Jeffrey Kindle, decided to punish loyal, longtime shareholders by cutting the dividend in half even though the company's balance sheet is far less stressed than that of GE's. He spit in the eye of so many who have stood by Pfizer for so long and nothing but a lame excuse for his actions. If you are a Pfizer shareholder, as I am, voice your unhappiness with Mr. Kindle. It's sad when Opec has to tell U.S. lawmakers and regulators what correct policy should be regarding speculation, however, "free market fundamentalism" rules policymaking in the U.S.
Jan. 28 (Bloomberg) -- OPEC wants U.S. regulators to curtail oil trading by hedge funds and speculators who helped make last year the most volatile in crude oil trading. Abdalla el-Badri, secretary-general of the Organization of Petroleum Exporting Countries, is seeking rules to “limit the level of speculation” by investors who buy oil without planning to use it. Oil surged 46 percent in the first half of 2008 to a record $147.27 only to plunge by the end of the year, prompting OPEC to make its biggest ever supply cuts. While congressional leaders proposed legislation to curtail speculation as rising oil caused gasoline to reach $4 a gallon last summer, regulators at the Commodity Futures Trading Commission are divided over the role of hedge funds in last year’s surge in prices. A series of OPEC supply cuts failed to boost prices as demand weakened in what may be the worst global recession in the postwar era. We may not get it! They are extremely well organized and funded. Plus, opposition by Republicans in Congress mounting. And, inexplicably, Obama feels like he has to form a bipartisan consensus on this, despite getting nearly 64 million votes, a mandate, Democratic control of Congress and zero need to appease Republicans. All we need now is another terror attack on U.S. soil and the folks who voted for Obama will be begging to have Bush back! Jan. 27 (Bloomberg) -- Royal Dutch Shell Plc sold more than 1 million barrels of crude stored off the U.K. and a vessel hired by Citigroup Inc.’s Phibro LLC left its anchorage in Scotland for the U.S. as the incentive to keep oil in tankers disappears. A sign of increasing demand for physical. Shell sold two 600,000-barrel cargoes of North Sea Forties crude for delivery in mid-February at Scapa Flow near Scotland’s Orkney Islands to oil trader Vitol Group, the companies said. The oil, already on board the supertanker Oliva, has been anchored off the U.K. coast since at least December, according to Bloomberg vessel tracking data. Vitol’s back in the game again after trying to run a corner last summer, until the CFTC got wind of it. With regulatory fervor now all but gone, Vitol will lead the way for other specs and commercials pretending to be commercials, but really speculating. Forty-thousand new layoffs were announced yesterday yet Obama is wasting time trying to forge a bipartisan consensus on the stimulus. Democrats have the votes to pass the measure now, but the president prefers to dawdle and try to placate resistant Republicans for what kind of long-term political support, I do not know. Meanwhile, American families suffer. Some facts that should pop the aura surrounding Peter Schiff. In the latest release of its weekly statement (Jan 22) the Fed's balance sheet is down about $200 billion ($2.1 trillion) from the peak back on January 2 ($2.3 trillion). About $130 billion of that reduction came from the Fed's foreign currency position, which is marked to the market. Are those currency losses? Where are the journalists, lawmakers, economists and other screaming about this? They only scream about help to American businesses and households, I guess. When it comes to losses on loans to foreign entities, nobody says anything. The article by Peter Schiff that appeared the other day in the Opinion section (The World Won't Buy Unlimited U.S. Debt, WSJ January 23, 2009) was so profoundly flawed in macroeconomic understanding that it’s hard to comprehend why the Journal would run such drivel. It’s bad enough one man’s warped and backward view of economics gets this kind of attention, but what is most disturbing is that much of today’s policy has at its core, the same embrace of the myths and superstitions that drive Mr. Schiff’s view of the world. According to the latest figures from the Bureau of the Public Debt, the national debt is $10.6 trillion, of which $6.3 trillion is held by the public. Roughly half of that amount is held by foreigners with China, Japan and all Oil Exporters (Saudis as well as others within OPEC) accounting for about $1.4 trillion. That’s about 22 percent of the total U.S. debt held by the public or 13 percent of the overall debt. What’s important to understand, however, is that the national debt of the United States is small relative to other countries. As a percentage of GDP our debt is smaller than that of France, Germany, Canada, Italy and far, far smaller than that of Japan. And if you were to count only debt that is owed to the public, the U.S. debt would be almost insignificant in relation to much of the rest of the world. Yet this perspective is often not provided or worse, conveniently omitted by propagandists like Mr. Schiff. Countries like China and Japan have long engaged in policies designed to support their export industries and exports remain an important part of their economies. It is no wonder, therefore, that they have accumulated big dollar reserves. The accumulation of dollars has been a consequence of a determined policy that favors exports as a means of creating jobs and sustaining aggregate demand. The purchase of Treasury securities by foreign nations that export goods to the U.S. does not constitute the “funding” of America. The U.S. government offers an interest bearing account known as a Treasury security to anyone who wishes to exchange reserves (official or otherwise) for something that pays a higher return. In the case of oil exporting nations their oil is priced in dollars so they naturally have accumulated dollars as a result of their oil sales. The Saudis or any other producers are free to price their oil in euro, yen or any currency they want. That is irrelevant. What is relevant is the currency they want to save in. If they sell oil in euro but net save in dollars, then nothing changes. To say that foreigners cannot fund their own domestic spending initiatives or use the money to buy other assets because somehow they are obligated to buy our Treasuries is patently absurd. Countries like Japan and China have the choice to spend and invest domestically or continue supporting export driven growth, as do all sovereign nations. The latter choice has been their desire for decades, for reasons that are as much cultural as anything else. This could change as economic weakness causes them to consider boosting domestic investment in order to provide economic stimulus. Should this happen at the expense of their exports to the United States, then, yes, accumulation of dollar reserves will slow. However, this portends nothing. What is lost on Mr. Schiff and many others who ponder the question of who is going to continue buying U.S. debt, is the fact that the money to buy Treasuries comes from government spending itself. Payments made by the Treasury, whether they go for the payment of social security, salaries to government employees, bailouts, infrastructure investment or deficit spending, result in an increase in reserves available to depository institutions. When the Treasury sells bills, notes and bonds, they are “paid for” with bank reserves that were put in the banking system as a result of that spending. The sale of Treasuries, therefore, is nothing more than a reserve maintenance operation and does not constitute borrowing, per se. The best way to think of a Treasury security is an interest bearing account offered by the government in exchange for the reserves already put in the banking system as a result of spending. In practice, any sovereign currency-issuing nation whose money is not backed by gold or subject to some fixed exchange rate can spend all it wants. A nation that spends in its own currency, as the United States does, can never be said to be borrowing. The government could, if it wanted, eliminate all sales of Treasuries without any impact on its ability to spend and invest. Recently some economists have even been suggesting this because it would allow greater flexibility in dealing with the economic crisis. Instead of using Treasury sales to manage reserves the Fed could pay interest on reserve balances—something that it has recently started to do. Where C equals personal consumption, I equals business investment, G equals government spending and investment and NE equal to net exports (exports minus imports). While it may be true that consumption is currently suffering due to scarce credit, a sufficient boost in government spending could offset that, causing overall GDP to rise. This is why Nobel Laureate, Paul Krugman, along with many other respected economists, argue for a large fiscal stimulus. They correctly understand that government spending is an important component of GDP and something that can be increased quickly in order to bring output back up. Furthermore, the United States does not, uniquely, have the ability to pull itself out of the mire simply because of the dollar’s status as the world’s reserve currency. Any country that spends in its own currency and where spending by government results in the increase in base money in the banking system can do the same. Severe austerity happens only in cases where countries are on a gold standard or under a fixed exchange rate regime. These arrangements have been disastrous in the past and it’s the reason why most of the world operates under a floating exchange rate, non-convertible currency system. President Obama called for sacrifice yet Americans have already sacrificed, enormously. Eleven million people have lost their jobs and many more likely will. We are a nation where 43 million people are without health care but the services are there for them. Half the families in this country can’t afford to send their children to college when there is the space. Many retirees have seen the value of their savings cut in half. We have three million unsold cars, five million unsold homes and nearly thirty percent of our industrial capacity sits idle. In short, many of the wealth producing assets of this nation are sitting idle for no good reason. In this regard Americans have sacrificed a lot and continue to sacrifice because of politics and policy weighed down by the same backward thinking as that of Mr. Schiff’s. It is one thing to ask people to sacrifice in times of plenty or when war demands the ultimate sacrifice in defense of our nation. However, it is morally reprehensible to sit by and allow a nation’s citizens to suffer as much as they have when the means to end the suffering lies in our hands. There is no excuse for this. We are a nation of great abundance and plenty, but we choose deprivation because of a belief in myths and false dogmas. Michael Norman is an economist and private investor. This is another example of Obama's weak leadership by consensus. He won the election by a huge margin; Democrats control Congress. He has a mandate. Yet he prefers to build bipartisan support when he doesn't need it and when the Republicans' policies were totally repudiated by the voters. Any "support" he garners from Republicans now will be fleeting. They will abandon him and blame him, first chance they get. It is a huge political mistake and it makes Americans suffer longer for no reason, particularly all those who voted for him. This is hard to understand. It can only be explained as insecurity on his part, which is a dangerous thing for the country. Other world leaders who are not America's friends might pick up on this and try to test how far he is willing to go. "Timothy Geithner’s warning that President Barack Obama believes China is “manipulating” its currency..."
This is terrible policy and a continuation of what the last administration was doing. No change whatsoever. The U.S. believes that the solution to our "problem" lies in making America an export-driven economy like China, however, only way to accomplish this--to gain comparative advantage--is to bash our currency down relative to China's currency. Ultimately this results in a lower standard of living for Americans vis-a-vis the Chinese. It's gold standard thinking, but we are not on a gold standard anymore. Someone in Washington ought to wake up and recognize that. The extra yield investors demand to hold 10-year French bonds instead of the benchmark German bunds widened to 57 basis points on Jan. 21, the most since the euro’s debut a decade ago. The average yield spread in the past 10 years was 8 basis points. France is no longer a currency issuing nation, meaning that the government can no longer spend by simply crediting bank accounts. If the government needs money it must borrow--either from the savings of its citizens, or those of foreigners. This means the debt is a real problem and must somehow be financed. That is not the case of countries like the U.S. or Japan or Britain or any other sovereign currency issuer that can spend by merely crediting bank accounts. In these cases there is never a risk of a payments crisis, but in France there is. That risk is also present in the other Eurozone members. Is it time to buy the British Pound? The British pound has been falling since November 2007 and recently hit a 23 year low against the dollar. Is it time to buy? Two contrarian indicators suggest that there may be an opportunity to play the pound from the long side. First, as I mentioned in a post yesterday, Jim Rogers, who is cold as ice when it comes to his forecasts (shorting Treasuries, shorting the dollar, commodities, etc) recommended selling the pound the other day. Back in my days when I was a floor trader one popular trading tactic the savvy traders used to employ was "fading" traders in the pit who were on a cold streak. No one is colder than Rogers at this point in time, so it's probably a good idea to do the opposite of what he says. The second contrarian indicator is Fox Business, which ran a story on its air yesterday about the weakness in the pound (see clip here). When Fox Business starts focusing on a theme, it's probably close to being over. You can buy the pound via an ETF. That is the CurrencyShares British Pound Sterling Trust (FXB). Excerpts from a story that appeared in the Chicago Tribune. Like revisionism in history. The "Holocaust didn't exist," etc. Nobel Laureate Gary Becker says any benefits will be modest at best. For the government to finance infrastructure spending or tax cuts, it has to borrow money. The money is thus unavailable for private investment or consumption. Right now, companies and individuals are having trouble getting credit, which is a big reason for the downturn. But if the government borrows more, they will have an even harder time finding lenders. So the effort could be self-defeating. That's a Nobel Laureate who doesn't understand that in a world of floating exchange rates/non-convertible currency, currency issuing governments spend by crediting bank accounts and the spending occurs BEFORE the sale of securities and the collection of taxes. Thus, gov't deficit spending ADDS to the net worth of the public in the form of higher holdings of Treasuries (which are assets), without any effect on the net financial position prior to that spending. Translation: it takes nothing away from the public's holdings of cash or other assets. Nor does it inhibit in any way the public's ability to invest their savings. If anything it adds to it because the government is a net payer of interest, meaning that the extent interest payments add to overall income, savings should be higher and, therefore, investment. Remember, as stated in the Fed's manual: "A payment by the Treasury adds to the amount of reserves available to depository institutions." This dynamic is clearly stated right there and says, unequivocally, that spending by the Treasury ADDS to the money of the private sector. Jim Rogers, desperate, turns his negative prognostications on the U.K.
Why anyone still listens to this guy is beyond me, however, he remains a media favorite especially over at Bloomberg. Most investors, with the exception of the nimblest, have already been buried by his commodity predictions. Anyone left with any money after following his advice ought to be given a medal. Perhaps a Purple Heart. "There are no shortcuts or quick fixes to this crisis"
That quote, from President Barack Obama, appears on the OMB website. Disappointing to say the least. Perhaps the reason why Obama is so cautious is because his OMB chief, Peter Orszag--a noted fiscal conservative and deficit hawk--is pictured sitting right next to him. Orszag's concern over deficits is probably what keeps his boss from being more optimistic. It's discouraging. I've long argued that the military is functioning to provide more and more of the social services, education, health care and jobs of this nation. We allow this because as a nation we are not comfortable with direct government funding of things things. We see deficits, or we view it as socialism, however, when it occurs in this stealth fashion--via the military--we are okay with that. It's a terribly inefficient way to go about providing these basic needs of society and it should be morally reprehensible to us that some young people will go to war and die when all they really wanted was an education, health care and a job. It's also not fair to the many professional soldiers, sailors, marines and airmen who dedicate their lives to a military career. The Budget of the United States Gov't publication has historical tables on surpluses and deficits going back to 1789. You can access it here. Please go to page 21 of this publication to view the data. You will notice that the most powerful periods of economic growth (post Civil War, 1920s and 1942-1946) were preceeded by massive deficit spending that occurred very rapidly. For the economy to recover now we must see the same, perhaps in order of magnitude far greater than what is currently being proposed. This is what I have been saying for some time. "It is time for a greatly increased role for monetary policy through direct intervention of central banks in world stock markets to prevent bubbles and crashes. Central banks control interest rates by buying and selling securities on the open market. Akio Toyoda, the grandson of Toyota Motor Corp.’s founder and the company’s next president, will confront a challenge largely unknown to his ancestors: decline. But Toyoda won't be able to save the day for the company his grandfather founded because with the Japanese government no longer intervening to keep the yen weak and with Japan's markets far more open now than in past decades, Japanese automakers will begin to look eerily similar to Detroit's Big 3. Without the help of protectionism and subsidies, Toyota, Nissan and Honda will lose their comparative advantage. In the end people will come to realize that the success of Toyota and other Japanese automakers had nothing to do with Detroit's cost structure or lack of competitiveness. It had everything to do with Japanese industrial and export policy. Former Bank of England policy maker Charles Goodhart says that English Prime Minister Gordon Brown should “sack the U.K. Debt Management Office and refrain from issuing government bonds as a way of bolstering the economy." At least this guy understands that issuing Gilts (or Treasuries, in the case of the U.S.) is not borrowing, but merely a reserve maintenance activity. However, reserve maintenance can be accomplished by paying interest on reserves. There is no need to issue securities at all. Later denied by the Irish PM, but scary nonetheless. It's going that way. According to the debt-doomsday crowd we should all feel a lot better now that the trade deficit has been cut in half. So how come things feel a lot worse? The trade deficit was never a reflection of the health or vitality of the U.S. economy. Rather, it was a function of economic policy engaged in by U.S. trading partners and the fact that the dollar was held as the world's reserve currency. Both were major factors that drove the trade deficit. Student auctions off virginity for offers of more than $3.7 million! This is the great United States of America, where kids who can't afford school have to become prostitutes to pay for it. We don't let the government pay because of the deficit! I guess the fiscal conservatives view this as better than running a deficit. Morally repulsive!! Maybe those who want health care but can't afford should do the same. At least it would be a "free market" solution. While a new Congress and a new White House debate details of an economic stimulus plan, Social Security recipients are already reaping a $38 billion windfall. The extra money comes thanks to a quirk in the Social Security Administration's regularly scheduled cost of living adjustment. Every year, Social Security payments increase along with the Consumer Price Index for Urban Wage Earners and Clerical Workers. The increase is set at whatever the change in inflation was between July and September from one year to the next. The program that so many hate and call broken, is one of the few things helping to sustain the economy and keeping millions of people from experiencing real economic hardship and depression. If fiscal conservatives get their way the U.S. will privatize Social Security and the results could be disastrous as retirement savings are exposed to the vagaries of the stock market. Remember what happened to Fannie Mae and Freddie Mac once they were privatized. Democrats such as Budget Committee Chairman Kent Conrad complained openly that many of the incoming administration's proposed tax cuts wouldn't work. Republicans warned against excessive new spending, with both parties signaling the incoming president they intend to place their own stamp on the economic recovery effort. "Doing things that would have a permanent effect when we face trillion-dollar deficits as far as the eye can see is just unwise," Conrad said. Ominous developments, but just as I have been predicting. In the week ending January 3 claims for weekly unemployment insurance dropped 24k to 467k. This is the lowest level since October 11 and suggests that tomorrow's nonfarm payroll report will not be as bad as expected. Ever since his election victory Obama's been switching back and forth between the roles of the Good Cop and the Bad Cop. When he plays the Good Cop and talks about the need for massive stimulus without regard for deficits or fiscal prudence the stock market rallies. But on the days when he plays the Bad Cop and talks about controlling spending and being fiscally responsible, the market tanks. Today he created the new White House post of "Chief Performance Officer," a term with private sector connotations if there ever was one. That person will be charged with the task of overseeing all areas of federal spending and seeing where there is "waste and inefficiency." Embodied in this position and indeed, the very concept of this position, is the notion that government should be run like a business--lean, mean and profitable. The problem with this is that it removes from the public sector all counterbalance to the private sector, which is extremely troubling now that the nation is experiencing a severe economic downturn. It is precisely during times like these that the government must "lean against the wind" and not blow with it. Promoting thrift and efficiency is a good goal for government if the nation's resources, capital and assets are all being fully employed and its citizens are living at their highest potential. But granting a bureaucrat the power to arbitrarily single out spending programs when the economy suffers from a lack of demand, rather than excess, is like putting an anorexic on a diet. Today Obama is the Bad Cop. Today the market is down big. More examples of fiscal conservatives setting the agenda. Obama creating a new White House post: "Chief Performance Officer." Definitely sounds like a private sector concept. Embodies the concept of government as a profit seeking enterprise. This is bad. "President-elect Barack Obama said Wednesday that reforming massive government entitlement programs -- such as Social Security and Medicare -- would be "a central part" of his effort to control federal spending." It is IMPOSSIBLE for the government to overspend. Fiscal vigilance now is like limiting calorie intake for a dying anorexic! One of India's biggest companies and a darling of investors through the boom. Just another ponzi scheme! And you probably thought Madoff was an isolated case. Starting to appear like there may be many, many, more like him. As long as fiscal conservatives continue to have a vice grip on economic policy, we will repeat, endlessly, this pattern of several years' recovery followed by slump or crisis because of fiscal drag. Keynes called it, "Running in a state of perpetual, semi slump." Heating oil prices will soar as alternatives sought to replace nat gas for winter heating. This will drive up entire energy complex. Specs to pile on. Expect the media to miss this story altogether and blame rising energy prices on the Israel-Hamas conflict. Anyone who thinks the oil market is a "free market" is seriously delusional. The two largest producers--OPEC and Russia--have enormous power over prices. Russia's curtailment of gas supplies to a large swath of Europe in the middle of winter is causing a scramble for other heating fuels, like heating oil, and that is driving up the entire energy complex. Speculators add to this buying pressure. CNN Money: Bonds in 2009: Mass Exodus Ahead? There has been a feeding frenzy by journalists on the subject of trying to pick a top in bonds. All the wrong analysis. Bonds will fall when the Fed decides it wants rates back up. Not sooner. Wonderful if he delivers, however, I am just wondering if he has spoken to Senator Mitch McConnell (R-KY) yet, or the other Senate Republicans who are prepared to obstruct any quick passage of this stimulus. It's one thing to have an enthusiastic meeting with your buddies on the same team, like Nancy Pelosi and Harry Reid, however, something tells me that Obama's statement about "quick passage" is more political strategy than anything else. If the stimulus doesn't pass quickly he can always blame it on the Republicans. Some banks may have needed more capital but most did not need the Treasury's infusions in order to lend. In fact, all the big banks--Citi, JP Morgan, Bank of America, Wells Fargo--were pretty much forced by the Treasury to take the money. Yet before the, "We're gonna make you an offer you can't refuse," action by the government, lending was not being constrained by an insufficiency of capital. Rather, lending was and is being hampered by a weak economy, severe job losses and declining asset values. Those are not things that will be fixed by giving fresh capital to banks. Nor will lending resume in earnest just because interest rates are historically low. The key is to stimulate demand in the economy and the only way to do that now is via fiscal measures. The government must spend or give money to households and businesses--either directly or thru tax cuts--in order to prime the pump and get the economy moving again. Only then will credit begin to flow anew. The Fed is beginning to see that interest rates have little bearing on loan creation. 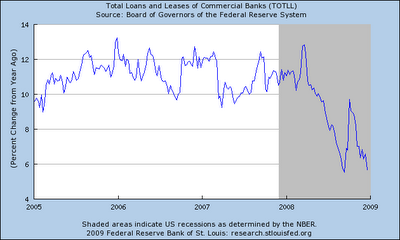 The chart below shows how bank loans are growing more slowly now despite the Fed's actions to reduce rates. Loan creation is a function of the economy. In a weak economy loan demand will be flat to down and the Fed is beginning to understand this. That is why the Fed is calling for a big fiscal stimulus. For all those who believe in a "free market." A cartel ultimately can set prices wherever it wants. By the way, the Russians are now in the process of doing the same thing with gas. Most disturbing is the fact that Congress did nothing to reign in speculation when it had the chance back in July. Conservative Republicans killed that. Expect the specs to come back in on the long side and push prices back up again. This time, don't expect OPEC to be quick on reversing their output cuts. They may let oil go to $200 first. The markets want one too! But it makes no difference what Obama, the Fed and the markets want. It's up to Congress and it will not pass in the size sought, nor will it pass anytime soon. Hobbes was right to reject separation of powers in his definition of legitimate government. The central authority must have control of executive, judicial AND legislative power. Congress is more trouble than it is worth. "Italy did for retirement financing what President George W. Bush couldn’t do in the U.S.: It privatized part of its social security system. The timing couldn’t have been worse. The global market meltdown has created losses for those who agreed to shift their contributions from a government severance payment plan to private funds meant to yield higher returns." How ironic. Italy of all places, long known for its entrenched socialism, embraces what many U.S. leaders have been promoting--privatizing social security--and it proves to be a horrific failure. This won't stop conservatives from trying to foist the same disastrous scheme upon Americans. “It’s going to be very difficult to get the package put together that early,” House Majority Leader Steny Hoyer of Maryland said. “But we certainly want to see this package passed through the House of Representatives no later than the end of this month, get it over to the Senate, and have it to the president before we break” in mid-February. Unreal! More people will die. (The crime rate/murder rate is a function of the economy.) Congress has already left people in the lurch for two and a half months, now they are saying, "You'll have to wait longer." This could bring some renewed weakness to the stock market. It increasingly looks like Hobbes had it right in his rejection of separation of powers when it comes to governments. Assmeblies, such as the U.S. Congress, does more harm than good.